As a wine and hospitality professional I study service obsessively. The ability to anticipate guests’ needs and to guide them through dining or drinking experiences that will leave them loving your establishment — and loving food and wine in general — more than they did before is the mission of nearly every person who works in this industry. But in spite of our greatest efforts, care, vigilant attention to detail, guests at times will leave unhappy — even irate. Sometimes it is the fault of the restaurant: the manager, the waitstaff, the bartender, the hostess — somewhere along the line we dropped the ball. We were busy, distracted, understaffed; someone was having a bad day or other elements beyond our immediate control collided to our demise. But sometimes, I blame the guest. Yes, that’s right: how good your experience is at a bar or restaurant is largely up to you. Being a passive diner will more often than not leave you disappointed. Having a good experience means being proactive. 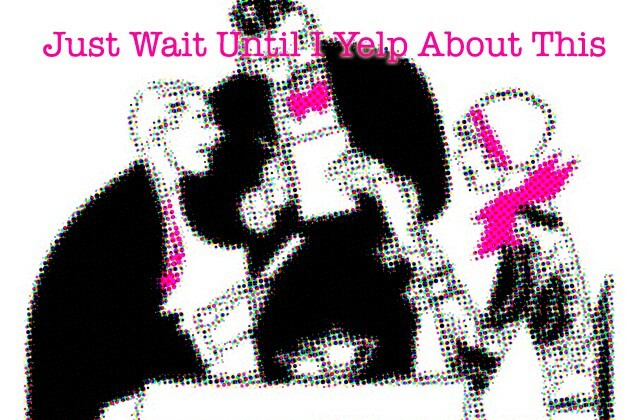 Some diners, fueled perhaps by the future Yelp review they look forward to writing, go out expecting to be treated badly and then spend their entire experience just waiting to be wronged. Case in point: At one local establishment recently, two girls seated themselves on cushioned chairs around the open fire pit. It was a sunny afternoon, they had their feet up, dark sunglasses on and honestly, they appeared to be sleeping. While selling wine and food is our primary goal, we are not opposed to visitors resting and enjoying the space. It was a busy weekend and there were several other groups enjoying glasses of wine while multiple members of the staff buzzed about. It was quite possible they were simply enjoying the garden; it certainly looked that way. Eventually, these two girls got up, stretched and left. We thanked them and wished them an enjoyable rest of the weekend. Once inside, they proceeded to tell the manager that they had been completely ignored for nearly 45 minutes. It was not untrue. By not opening her mouth and asking for a menu (and instead doing her best impression of someone who had just been drugged), she turned what would have otherwise been a pleasant afternoon into a inchoate disgruntled Yelp post. Just, perhaps, what she had been hoping for. This young lady clearly was a victim — not of bad service but of her own passivity. 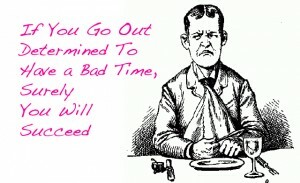 When I go out to eat, I have a good experience 99 percent of the time. Partly, because I choose to. If your bartender tries to make your hot toddy with Bacardi, clarify that you would, in fact, prefer whiskey, please. If you want to finish your Negroni before your cauliflower soup arrives, ask the server to please wait to fire your meal until you’ve finished your drink. Servers aren’t mind readers — he may think that you enjoy that particular pairing. If you feel strongly that you would like your wine decanted or that you would prefer to pour it yourself or that you would like your coffee with your dessert rather than after, please please say something. 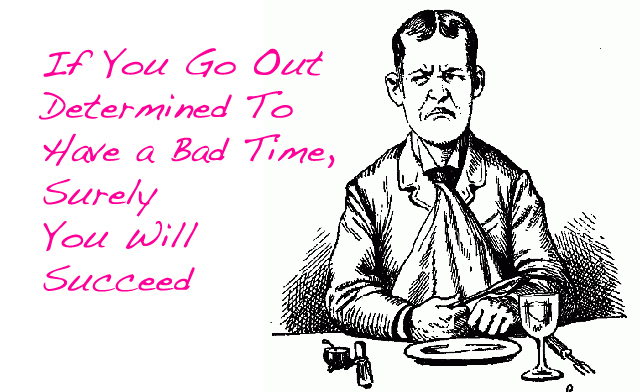 The point is that if you expect to have a good time, you will proactively go about doing so. Most hospitality professionals want you to have a good experience and jump at the chance to right a wrong — but you have to speak up. Knowing the difference between a fair request and an absurd one, is, of course, key. No one wants to be a high maintenance customer — coded “HM” in the reservation system. But taking the right action at the right time is not only appropriate, but welcome. Communicating your needs is how adults deal with situations. Stewing and feeling increasingly disgruntled because those unstated needs are not being met and then later spewing anonymously on Yelp is how entitled little children behave. But I Don’t Eat Meat! The menu is fairly well constructed, but is difficult for those who don’t appreciate meat and prefer not to eat salads for a main. Huh. I happen to know this restaurant very well, and the chef does gladly assemble vegetarian entrees (as do most meat-centric establishments) — upon request. But still, a steakhouse where the parking lot reeks of seared cow is not the most obvious choice for someone who does “not appreciate meat” and does not want to eat a salad, either. That’s not how I like it. The petit filet was a little more rare than I would have liked for a medium rare steak. Wow, what an easy thing to fix. A few more minutes on the grill and voila. It would have taken less time to fix than for you to “Yelp” about it. Every steak restaurant has a different definition for doneness. Set the chef up for success by describing how you like your steak cooked. For example, I like my steak charred on the outside and lightly pink in the center. Then only send it back if you are really, truly incapable of enjoying it the way it is prepared — knowing that the rest of the table will be enjoying their meal while you are waiting for yours. Ask yourself if it’s worth it for the overall enjoyment of the evening. Oftentimes, it’s not. The food after all is only part — albeit an important one — of the overall dining experience. How could they seat me here? It seems to us that the diner — a white person — is the one doing the judging here, but whatever. Then I see the whole section is either minorities or young-looking people — our section doesn’t even have table cloths, whereas the other formal section does. God knows what was actually happening here. There are any number of reasons a hostess would seat someone in the bar (believe it or not, some people actually prefer sitting in the bar). But clearly this diner is suffering not from profiling, but from extreme narcissism. She eventually asked to be seated in the dining room and was happily moved. But apparently, this affront, which she spent three paragraphs describing was, sadly, her takeaway from what was, according to her, an “otherwise” good experience. Likewise, one young lady felt that she was not given enough attention because of what she ordered. “Someone who orders a cocktail and an appetizer should be treated with just as much enthusiasm as someone who buys an expensive bottle of wine.” Believe it or not, your server is not judging you and probably doesn’t care how much money you spend. They just want you to be nice, respectful and leave a fair tip.That table with the expensive bottle of wine demands more time and attention because well, expensive wine demands more time and attention. Tonight, a friend and I went in to grab a drink, as we’ve done many times before. After a few minutes with no attention from the bartender, he held up his hand. Apparently, she took offense for some reason I still don’t understand. After another 10 minutes, she finally asked for his order, then poured some beer and took our money. If you are standing at a bar, no matter how busy it is, there is a very good chance that the bartender sees you. They are professionals. If they are ignoring you it is because a ) they are very busy, b) you are drunk or c) you’re acting like a jerk by waving your arms around and pushing women and children out of the way. Eye contact and a smile is the way to go. A slight hand in the air, accompanied by said smile and eye contact is permissible. If you continue to be ignored, go somewhere else. We were prepared for battle. We came here to see one of our fave performers and as I was reading the reviews I was honestly scared. Almost every review mentioned how rude or disrespectful the bartenders were. I planned on drinking and I didn’t want to get into it with any of them. …. We eyed our table, went to the bar and prepared ourselves to battle the bartenders. Please, for the love of god, do not approach a bar with the intent to “battle” the bartenders. Surely, you will lose.